Here’s a cool gadget that’s a bit counter to the ‘keep it simple’ philosophy. 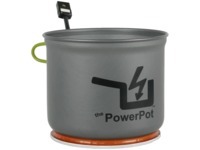 It’s a thermoelectric device buried under a pot, designed for backpacking use to charge your iPhone and other gadgets (you’re not really keeping it simple if you’re depending on those while backpacking!). So if you really can’t leave those gadgets behind when backpacking, this is the perfect solution to ensure they’re always fully charged. The alternative would be solar panels, though if you assume that you’ll be making a campfire regardless, then this might be more reliable than counting on sunshine. The inventors are currently seeking funding at Kickstarter; cost is $125. Sequence a human genome in 24 hours!